With all the depressing news these days, some good news is more than welcome. 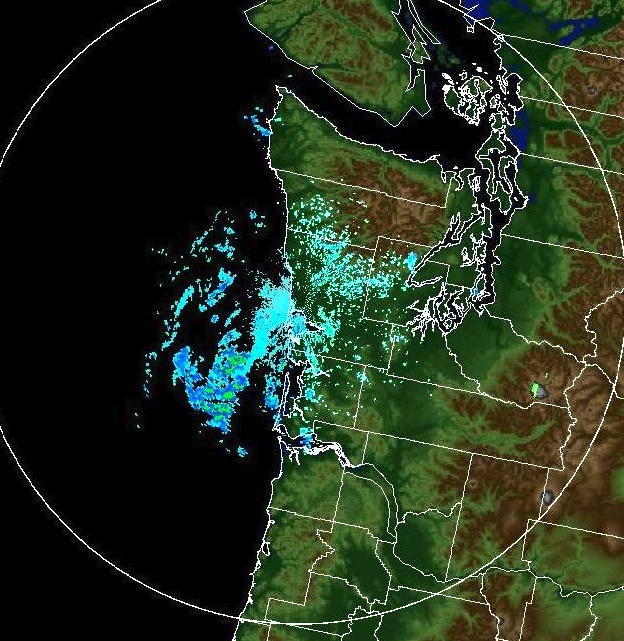 And I have very good news: some important Northwest weather history was made last week: the new coastal radar was turned on and we have received some of the first images. After nearly twenty years of local lobbying for this device, it is now a reality. Lets not beat around the bush. Here is one of the first images from the new Langley Hill radar, showing conditions around 7:38 AM on Wednesday August 4. This is from the lowest scan (.5 degree above the horizontal). The clutter suppression capabilities are not fully operational right now, so you are seeing some returns from the Olympics and the mountains of SW Washington. But look offshore--the greens and darker blues are from some very light rain over the Pacific. Can't wait for the first real weather system! There are some weak returns over the ocean near the coast, that might be reflections off the Pacific, but can't be sure from one image. Just for comparison, here is what we have now--an image at the same time from the Camano Island radar. See a difference over the ocean? The radar will be tested and calibrated over the next month and then will be taken down for two weeks in September to add an important new capability: dual-polarization. This will allow the radar to differentiate precipitation types far better and will provide superior precipitation estimates over the mountains. By the end of the September the radar should be back online and the output available through the web and on the media. But there is one more upgrade. This radar will be the first and ONLY National Weather Service radar in the U.S. to scan horizontally---called zero degree elevation angle. This will allow the radar to see much farther over the ocean and to see better at low levels. The NWS folks have decided to delay adding this capability until early November to insure it works properly. At that point, the radar will be complete and ready for the storm season, which hits hard after the first week in November. As I have mentioned on a number of occasions, Senator Maria Cantwell played a major role (in fact THE major role) in getting the resources for the radar. Her office has put out a press release with more information today and it can be found here. And don't forget the web site dedicated to the new radar (found here). This site is updated regularly. Weather this week---no major systems. No major offshore flow/warm-up situations, so don't expect 80s and 90s west of the Cascade crest! Lots of morning clouds with afternoon burn off.